But there is cake… and there’s edible art. Whether it’s a sweet teapot, a playful fishbowl or the recreation of a character from the World of Warcraft game, Candice’s details are impeccable. With the Vancouver Canucks and the Real Housewives of Vancouver among her fans, she is kept busy turning fondant and sugar into amazing creations. Cake has always been a big part of my life, not only in the eating sense, but also the decorating. My first job ever, at the age of 15, was to learn to decorate cakes for IGA grocery stores. I would work long hours, and would pump out hundreds of cake after cake. I really loved and appreciated the opportunity and if the job had paid more then $7.50 an hour, I’d probably still be there! What drew you to this in the beginning? When I was a little girl, I can vividly remember decorating a cake with my grandmother for my uncle’s new company. It had a little logo of a character’s face, and we made him out of black licorice. I loved this so much, and I think from that moment on I was hooked. I have always had a love of all things artistic, and I find the platform of edible art so much more satisfying – even when all of the hard work and time goes onto a plate and then into someone’s mouth. I love when people are enjoying not only the appearance of the cakes, but the taste is the key component to true cake bliss. How did you learn your decorating techniques? I was taught the basic piping and spacing techniques at my first cake job, but because the grocery store cakes were so routine, it wasn’t until I got into the world of fondant that my eyes were opened to the true possibilities of what you can do with sugar. 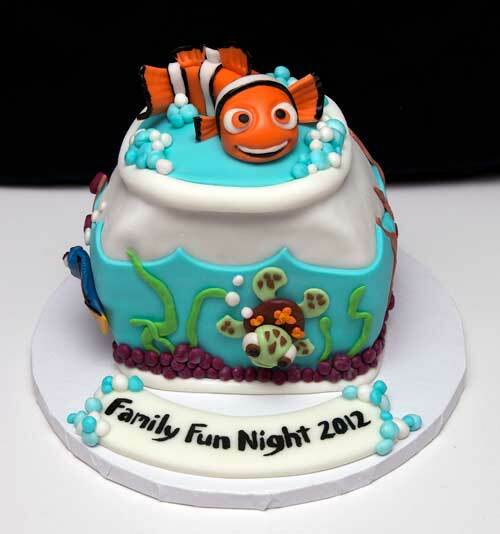 Working with fondant is basically like working with play dough. If you ever wanted to know if you could work with fondant, get yourself some play dough and go to town! I have been very lucky to make cakes for some well-known figures in the Vancouver area, and every time it happens I pinch myself. The opportunities have all come about because of social media… mainly Twitter, and its ability to connect the regular population with people who have a celebrity status. The support I get from the Twitter world in regards to cake is very humbling and flattering, and they are the reason that I have had these opportunities. 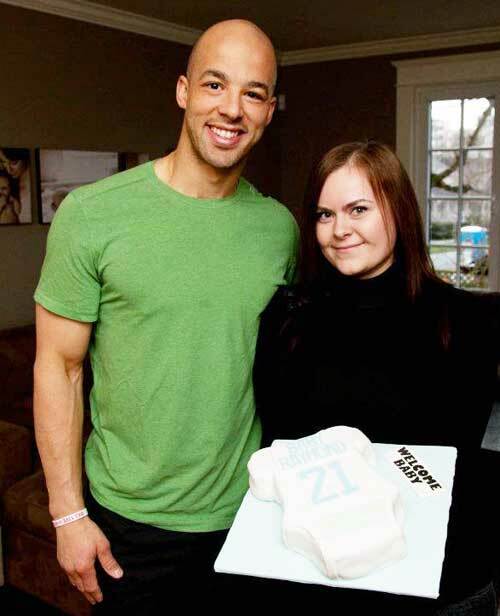 Through cake I have met many of my beloved Vancouver Canucks, including Manny Malhotra and his lovely wife Joanne, Corey Schneider and Daniel Sedin as well. I was even lucky enough to make three cakes for the team when they did a triple bachelor party. It was crazy to walk in and see the whole team there, and they were nice enough to give me an autographed team stick and take some pictures! When I went to leave after the delivery, I was already on cloud nine, and then I had to wait for Alex Burrows to get out of the way so I could get my car out. Believe me, I wasn’t in a hurry to go! A few of the cakes have been for the lovely Ronnie Negus of the Real Housewives of Vancouver, and it is always an absolute joy to deliver to these clients because I get to see a small glimpse of what the high life is like in Vancouver…and let me tell you – it is good. VERY good. What’s the most difficult thing you’ve made? What I always seem to have the most difficulty with is recreating faces out of fondant. It takes me a lot of hours to really capture the essence of facial features, and I’m not sure if I have perfected it yet. It is a challenge, and I like that, because if it was all easy, I would probably lose interest quickly. The challenge of trying to top the last cake is always my priority when I’m working, and I would NEVER deliver a cake that I wouldn’t want delivered to myself. 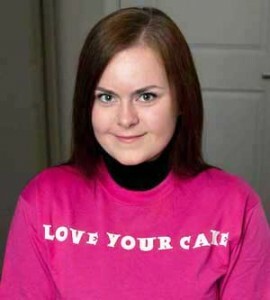 I’m OCD and a perfectionist when it comes to my cakes, and the whole point is that you love your cake…..hence the name! Do you have a favourite cake you’ve created? 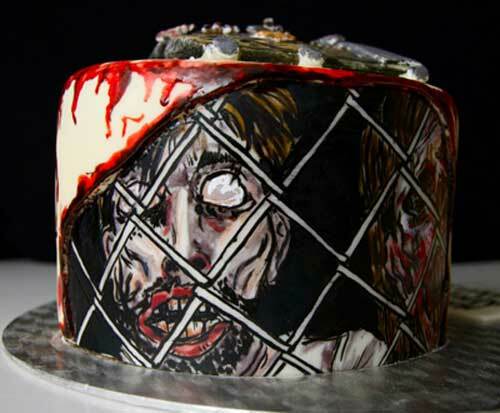 My favourite cake so far was a Walking Dead cake I made for a birthday. It allowed me to combine art and cake all in one, and after it was all done I actually thought about framing it. Since cake doesn’t frame well, I delivered it to the birthday girl and said my good byes, but sometimes it is hard to let go when you invest so much time! 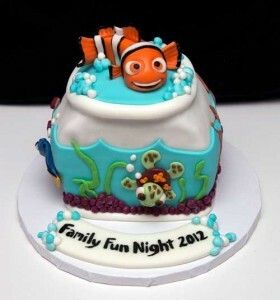 Children’s cakes are also fun – especially when the child chooses the design! This is probably not a surprise, but I actually don’t enjoy cake that much. If I had to choose a favourite, I would say that chocolate cake is always good – and I do enjoy anything with coconut and banana. Do you have a favourite tool or gadget you couldn’t live without? My paintbrush. Without my paintbrushes, I would be no different than any other cake you can get at Safeway. My paintbrush allows me to put a more artistic spin on caking, and I think that is what makes the cakes unique. Oh – and glitter. I love glitter, especially of the edible variety, so any opportunity to sprinkle on the glitter – I am all over it! A character from "World of Warcraft." Yes... it's cake! What other creative things do you do when you’re not making and decorating cakes? There’s time away from decorating cakes? Funny, I never noticed! I spend so much time on my fondant work that I really don’t do much of anything else. I have a full time day job outside of caking, so my nights and weekends are consumed with sugar and food colouring. I do enjoy photography as well, but mostly to take pictures of cake related things…or my super cute cat. As far as goals go, I try not to plan to far ahead. With so much craziness in life, you never know where you’ll be tomorrow. In the short term, I just hope to keep making people happy with cakes and keep myself busy in my time off from my regular day job. In the long term, I haven’t really thought about it. I like to take things day to day, and if I set up a long term goal for myself then I will be disappointed if I don’t meet it. The way things have been going, I am comfortable that I have not bitten off more than I can chew (pun completely intended!) The cakes will keep coming, and my creativity will keep flowing until people stop loving cake. But until that day comes, as long as you Love Your Cake, then I am a happy girl! Thanks, Candice, I’m sure people will love your cakes for a long time to come! Drool over more of Candice’s amazing creations on her Facebook page or her blog. All photos courtesy of Candice Roach. hooray hooray hooray!!!!!!!! Candice and You! TOGETHER ON ONE PAGE! YAY!!! This makes me soooo happy! Heehee! Thanks for the introduction, Rita! You weren’t kidding when you said Candice makes fantastic cakes! Great article Kate. Even though I don’t like sweets all that much, these cakes look delicious. Would like to see what she and Buddy could create together! Thank YOU, Candice! I’m so glad you could take part! Free cake??! Wow! You’re a sweetheart, I will let you know if I’m going to be in Vancouver!! These cakes are really amazing! I love the teapot! Wow. Those are really impressive. I especially love the teapot. Stopping by from Saturday Sharefest – have a great weekend! 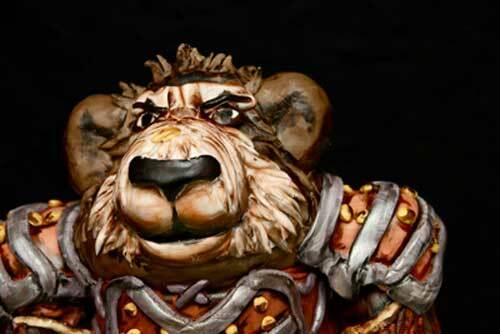 I love these cakes and really appreciate the work that goes into them. 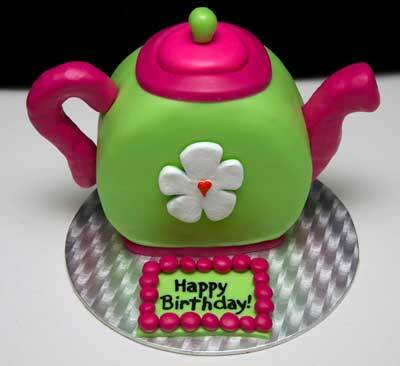 The teapot is my favourite, of course, but the Finding Nemo cake would be a hit with my nephew. Love the article! Love the cakes!! WHo doesn’t love cakes!? Love the teapot….much better than the one I made a few years ago…..
Rachel Cotterill recently posted..Please Help Send Me To Turkey! Thanks Kate for your friendly comment about writing down the things my 4-year-old says. If I didn’t have the blog, then I would lose many of these memories. I’m a sucker for all things pretty and sweet, especially cake and I enjoyed reading through this post and lookings at the creative cakes!